The SFL AR App can be found at the Apple App Store here. School Fab Lab AR brings together disruptive technology, augmented reality and education unlike anything before. Educators can build an entire makerspace or bring any object they desire into their classroom without needing anything more than an iPad. Think of anything that would aid you in the teaching of your subject and it can instantly be imported into your room. Using animations and interactivity, students are immersed in a learning experience that is rich and powerful. By engaging students’ interest and challenging their minds, you create impactful experiences that empower students to learn about STEAM subjects. The future of this app holds unlimited potential when you imagine the possibilities of what it can be used for when aiding an educator using augmented reality. Currently, the app provides you with an array of digital fabrication machines and objects related to STEAM education such as human biology, astronomy, history, art and a whole lot more. You can place and arrange objects – Digital Fabrication machines such as 3D Printers and Laser Cutters. Demonstrations can be created to teach in various categories, like Biology (a Human Heart) and Astrology (the Solar System). You can illustrate examples in Art and History, Geometric shapes, and Animals, to name a few, that will help students understand some difficult concepts. The SFL AR Beta App was introduced to a large audience in France as a part of Fab14 in July. 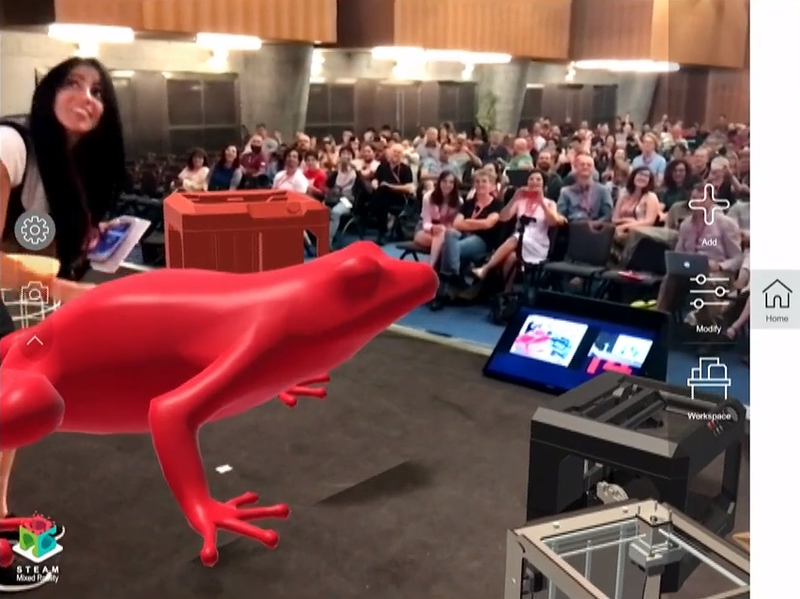 Fab Foundation’s Neil Gershenfeld asked Fab Lab Connect and School Fab Lab Co-founder Nader Shaterian to debut it at a morning workshop titled “Augmented Reality for Fab Education” – and it was a big hit. Especially interesting was the interaction with a large 3D-printed red frog! Here’s an abbreviated video from the Fab14 workshop, showing the previous version of the SFL AR App, PLUS a sneak peek of the new updated Live app. Augmented Reality for Fab Education a Hit at #Fab14! To experience the new School Fab Lab AR App for a discounted price, go to the Apple App Store. Fab14 Throughout France – Compilation Video Sums it Up!